Hello! 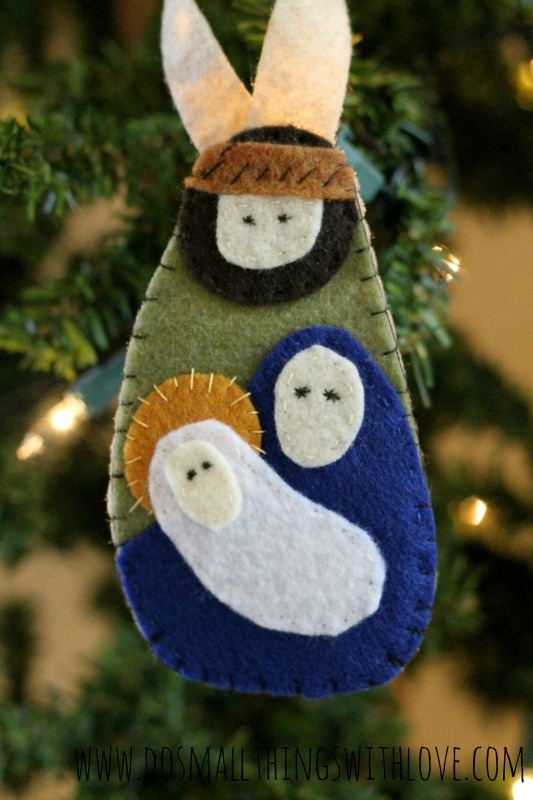 I am stopping by just briefly today to share another felt ornament I stitched up last year: Felt Holy Family Ornament. 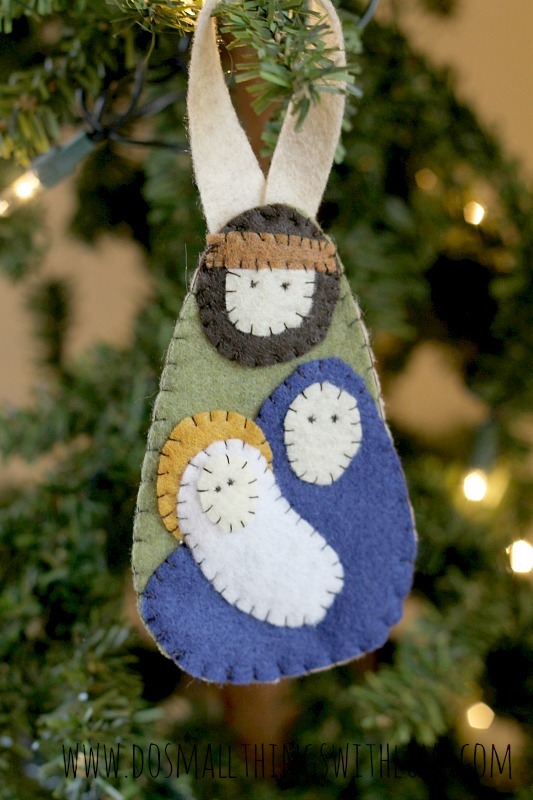 I stitched up these ornaments right before my daughter was born last December…and then in the craziness of these new infant days I never posted it…and in fact let the blog sit abandoned for 2 full months! But, I am happy to share them now. 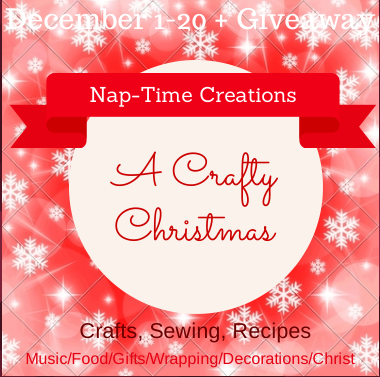 I am also thrilled to be sharing this today as part of my friend Emily’s Craft Christmas Series (get over there and check it out!!). Okay, be warned, with this ornament there is no template or even a tutorial. Like I said, I stitched this up while I was big and pregnant, and evidently too lazy to snap a picture. I should mention, however, that I did get the idea for this ornament from this pin on pinterest, and it too lead to very little–no template or tutorial, so if I can figure out how to make it, I have faith that you can too! Here is a very basic break down of how to make this ornament. There are three major pieces that are roughly ovals: Joseph (the biggest and cut 2), Mary, and Jesus. Feel free to use my pictures as guides for how to cut these pieces. Then, each person as a circle shaped head, Joseph’s is set upon a larger brown circle, which makes up his beard and hair. Then the stitching. Start from the bottom and work up. First, stitch on Joseph’s face and head piece. I just gave my figures eyes, instead of all of the facial features. The, stitch down Mary’s body and head. Finally, add Jesus’s halo, body and head. Finally, I cut a simple strip of felt to use as the hanger and sandwhiched this between the two Joseph body pieces (the top Joseph body piece is what you have been stitching too all along, of course). Then, as a final step I stitch all around the outside of the ornament with a blanket stitch. Finally, in case you didn’t notice, there is a slight difference between the ornament at the top of this post, and the one at the bottom. In the top ornament I used a whip stitch and dark thread to sew down all of the elements of the figures. In the bottom ornament I used a running stitch in a matching thread to sew down all of the elements of the figures–so you really can’t see the stitching, and only used the dark blanket stitch around the outside. And…I can’t decide which one I like the best. Thoughts? I plan on making a few more of these ornaments, just because I really love the idea, so if you have a preference on the stitching, I’d love to hear it! So little time this year, nice project for Tree or for tucking in Cards. Cute Simple and very Nice for Tucking in Christmas Cards… Will do next year, ,today is December 8, 2018. So many ideas and so little Time.. I plan on making some for my tree this year. LOVE this! Saved and printed out the photo.. used that as a template, and am making one right now! What a cute idea! I would love to see a pic of the finished product!!! Beautiful! I love this, Nancy!